A recent U.S. District Court for the DC Circuit ruling has given some teeth to the “foreseeable harm” standard codified by the FOIA Improvement Act of 2016. 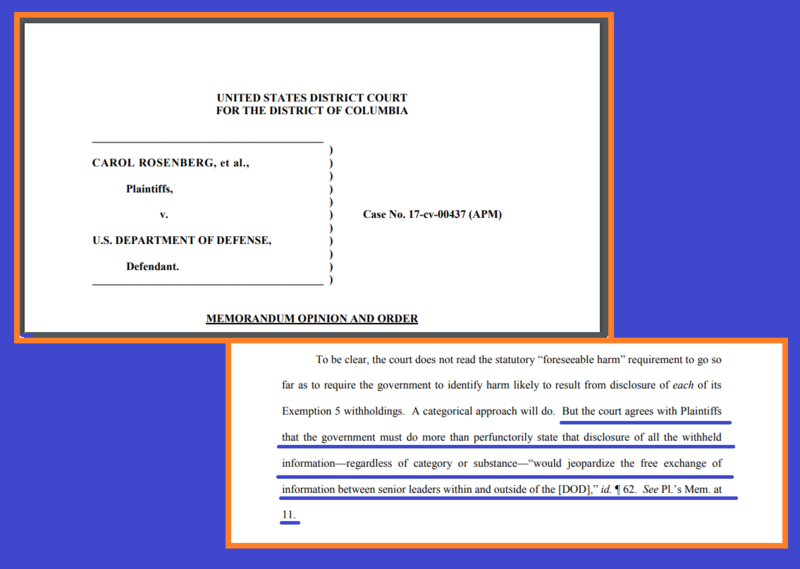 The court found in Carol Rosenberg, et al., v. U.S. Department of Defense, which seeks communications from then-Marine Corps General John Kelly concerning Joint Task Force Guantanamo, that “the government must do more than perfunctorily state that disclosure of all the withheld information—regardless of category or substance— ‘would jeopardize the free exchange of information between senior leaders within and outside of the [DOD]’”. This is an important boost solidifying that agencies can only withhold information under one of FOIA’s discretionary exemptions if the agency can identify a specific interest protected by one of FOIA’s statutory exemptions that would be harmed by the release, or if the disclosure is prohibited by law. 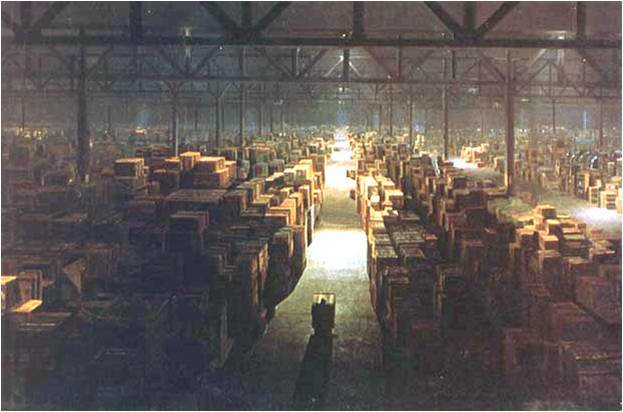 Our FOIA director Nate Jones recently published a terrific primer on what FOIA requesters need to know about the Washington Records Center, a NARA-owned purgatory for other agencies’ “recent historical” records, and how to get agencies to search their holdings there in response to requests. Absent comprehensive solutions that would grant NARA the authority to release these kinds of records on their own, historians, researchers, and requesters hoping to access records from several decades ago will have put this line in all of their FOIAs, MDRs, and appeals: “As you know, your agency is required to search the records stored at NARA’s Washington Records Center in Suitland, MD, but still technically under your agency’s control.” Read the entire piece here. Twenty-five years ago last night in Moscow, Russian President Boris Yeltsin ordered tanks and airborne troops to shell and storm the “White House,” the Russian Parliament (Supreme Soviet) building, to suppress the opposition trying to remove him. Declassified documents published today by the National Security Archive and analyzed by Svetlana Savranskaya and Tom Blanton include the transcript of U.S. President Bill Clinton’s phone call to Yeltsin the next day to praise him, the memcon in which U.S. Secretary of State Warren Christopher subsequently told Yeltsin this was “superb handling,” and two State Department cables painting a more complex portrait of the causes of the events. The posting also includes two oral history accounts, one from then-Russian Defense Minister General Pavel Grachev about his specific role, including his orders to fire the tank cannon that set off a “beautiful fire” in the White House, and the other from U.S. Ambassador Thomas Pickering who believed the U.S. had “no choice” but to support Yeltsin. This week marks the fiftieth anniversary of the notorious Tlatelolco massacre, when the Mexican government killed dozens of students and bystanders protesting the authoritarian regime in a public plaza at Tlatelolco, Mexico City. Across the country, citizens are commemorating the event with marches and rallies, conferences, exhibitions, and performances. But even as Mexico acknowledges the legacy of the student movement of 1968 and grieves the long-ago slaughter of its young leaders, the Mexican government has quietly removed, censored, and reclassified thousands of previously accessible archives from that era. Kate Doyle, senior analyst and the National Security Archive’s Mexico project director, has much more on the ongoing saga here. The open government community recently learned that Steve Garfinkel, the long-serving director of the Information Security Oversight Office (ISOO), passed away late last month. In a lovely tribute to Garfinkel, Steve Aftergood notes, that “he played an influential role in the evolution of the national security classification system during its rapid expansion in the Reagan years and through the ambitious declassification initiatives of the Clinton era,” going on to say “Garfinkel made the whole system better than it was with the tools that he had available. He instituted training programs for classifiers, he restrained some of the excesses of agency officials, and he cultivated a rational approach to the diverse challenges that the late cold war classification system produced.” Garfinkel retired in 2002 and went on to teach high school in Maryland. In light of several cyber-attacks targeting major sea port operations, including ports in San Diego, Barcelona, and Long Beach, this week’s Cyber Brief highlights formative documents in critical infrastructure protection. These documents include Executive Order 13010, The Marsh Report, and PDD/NSC-63, which all help provide context for more recent documents specifically examining the cybersecurity of ports and maritime transport.